Rajesh Pratap Singh’s collection welcomed fresh colours on the runway; dark red, bright yellow and light shades of blue. The ensembles were structured in stripes and dotted patterns. The collection also comprised comfort wear from hoodies to jumpers and jogger pants paired with blazers and T-shirts. Beaded necklaces, earring and rose-tinted sunglasses accentuated the looks. Textured patterns, distressed fabrics, pleats and mini pleats were few of the techniques used. Four designers collaborated with four Usha Silai clusters from different parts of the country to create collections revolving around those clusters’ specialised embroideries. Amit Vijaya and Richard Pandav’s collection with Kaladhera referenced the Rajasthani kanjri and lehenga resulting in modern deconstructed separates in red and black. Sayantan Sarkar’s collection with 24 South Parganas used sublime batik prints on khadi, in colours of blue, green and maroon. Sreejith Jeevan’s collection with Puducherry was an interesting study in layers, inspired by French glass windows. Soham Dave’s collection with Dholka was created with surfaces and interesting textures on the black lock stitch machine and adhered to the monochrome colour story. With ‘Un-revive’, he reinvented the famed textiles of Benares with modern weaving techniques and metallic motifs. Emphasising on varak, precious metal yarns were combined with pastel colours to weave tartan checks, houndstooth, polka dots and contrasting stripes woven as a single fabric, using Tanchui and Katarwaan weaving techniques. The range of dresses, summer trenches, pleated skirts; culottes, trousers and saris were perfect for occasional affairs, especially as summer begins to set in. A side pocket and box pleats made for important details on all the garments. Titled, ‘In Transit’, Santanu Das’ collection for Maku brought beautiful textiles such as silk, cotton, khaki and jamdani from remote Bengal, in his signature natural indigo dye, easy-going forms with a hint of androgyny. Colours like white, indigo, grey and black ran through the collection in different styles such as stripes, ribbed accents, abstract motifs, gingham, twists, wrinkles and tiers. From traditional silhouettes such as angrakha kurtas to neat micro-pleated maxi dresses, the clothes were practical and simply lovely. Brooches made of similar fabrics made for cute accessories. 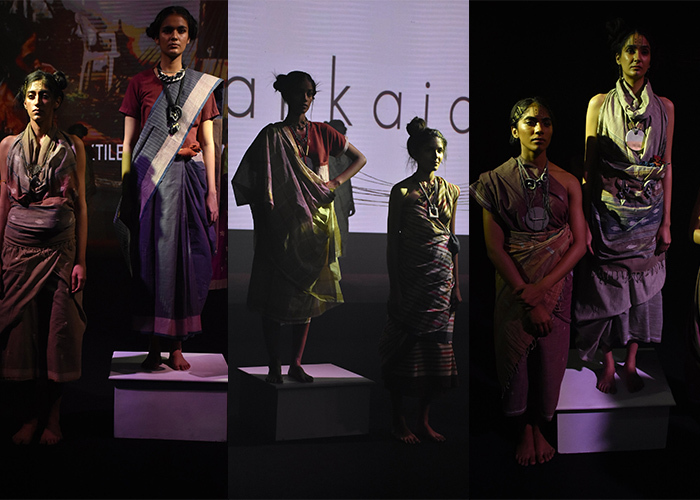 Pankaja Sethi in collaboration with Odisha Weaves presented a neo-tribal collection. Saris were finely woven with cotton in dark colour-blocked styles of greys, browns, maroons, blues and blacks. Pockets were incorporated in backless saris. Minimal and simple embroideries depicted fauna of fish and dragonflies for charm. Emphasising the essence of weaving were two women standing together with their hands connected with red and yellow threads. The statement jewellery was about large amulets and pendants tied to unpolished rope chains evoking a rustic sensibility. Paying homage to the modernist art of Nasreen Mohmadi, Padmaja’s collection was inspired by sublime hues such as ivory, beige, grey, taupe and rosewood. Textured saris of woven, natural-dyed, organic, cotton and linen were paired with patterned blouses, embroidered with unconventional textures. 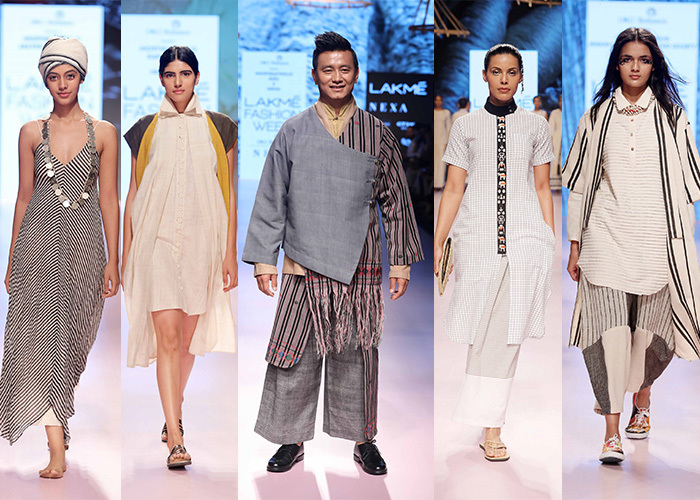 Kurtas were accentuated with subtle ribbed micro-pleats and constructed asymmetrically. The spacing of lines was played with on finely-woven fabrics with control. Pleats, folds, layers, sewing and oversewing lent the clothes simply captivating textures. Embroidered buttons, were the highlight of some of the ensembles. The Good Loom’s collection revolved around the minimal contemporary aesthetics of relaxed silhouettes, easy-going patterns and refreshingly subdued tones. For womenswear, lightly embroidered chanderi saris were given a stylish spin either with knotted pallus or extra-long statement belts paired with patchwork or shirt-blouses. The menswear collection was playful with colours of salmon pink, pale blue, light green, mustard and hints of purple. Jackets, shirts, scarves and trousers were cleanly tailored and portrayed ease. Day two, which was dedicated to sustainable fashion, kickstarted with a spectacular showcase of northeastern fashion. Six designers – Sonal Dubal, Daniel Syiem, Richana Khumanthem, Aratrik Dev Varman, Karma Sonam and Jenjum Gadi presented beautiful collections from Manipur, Meghalaya, Sikkim, Assam, Nagaland and Tripura, each state showcasing its stunning traditional fabrics and crafts.The earthy tones, pristine whites and flattering cuts won the spotlight.